Welcome to a Unique Painless Style of Acupuncture! Are you afraid of needles? Perhaps that is why you have not tried Acupuncture? Well, here at Yoshi's Clinic, we practice a unique and painless Acupuncture technique that is effective and treats the well being of your whole body. As a licensed and board certified professional in Acupuncture for over 20 years, Ms. Yoshiko Kage primarily practices a contact-only needling technique that does not pierce the skin. She uses specially designed needles that were created by a Japanese craftsman. These thick gold and silver needles that contact the surface of the skin, instead of penetrate, and gently shift the dynamics of energy throughout your body through a system of meridians. 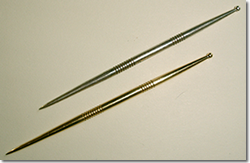 In Japanese, Acupuncture is called "HARI," which simply means needles. Despite using needles, traditional Acupuncture, if done correctly, can most definitely be performed successfully with little to no pain. But we have taken this further and use a completely painless style of Acupuncture. but no pain is ever caused by the needles whatsoever. Yoshi's Clinic also offers several core services that when properly integrated with painless Acupuncture treatments derives a maximum effect and a profound health outcome. When integrated with the painless acupuncture treatments, you can derive some profound positive effects on your health outcome.